Design won’t save the world, but it certainly can make it a better place. We live surrounded by objects; some of them are essential, while others just make our life more comfortable. This is the case with the Diskus®, used by people diagnosed with asthma and chronic obstructive pulmonary disease (COPD). There are over 20 million people diagnosed with asthma and 24 million with COPD in the United States alone, so using a medical device that provides the right dose in an easy way is indispensable; especially being the kind of drug that is self-administered. Designed by Gregor Anderson, leader of the Device Technology Group (DTG) at GlaxoSmithKline, the Diskus® is the result of his training in the design field, as well as the fields of polymer science & engineering and marketing. Being head at the DTG, he has worked on several devices, all of them concerning healthcare and more specifically, inhaler devices. Recently these experiences led him to develop a device focused on the importance of patient driven future inhaler attributes, which we can see displayed on the Diskus®. Despite not being a user, nor asthmatic, this is a very eye-catching product, and it invites dissection, something that we, the design enthusiasts, certainly love to do. 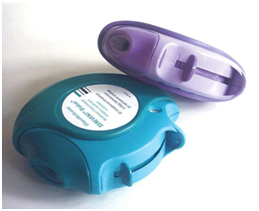 The Diskus® allows the user to inhale the drug, which is no longer an aerosol but a dry powder. The Diskus® container has a rather complex mechanism inside and is covered by a two piece polypropylene case, a polypropylene cover case, a mouthpiece and a lever. This mechanism has a two piece long foil ribbon with each unit dose held in a small caplet along the entire ribbon length. Once the lever is activated the dose is advanced by peeling away the flat outermost layer exposing the medication that is ready to be breathed in. The empty strip is separated in a compartment where it is collected by a base wheel. 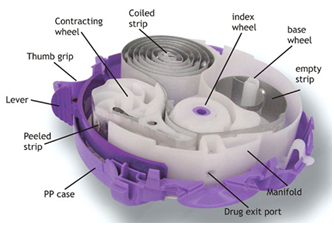 These wheels, very much like those used in clocks, also help activate the dose wheel indicator, which tells the user how many doses are left. These innovative functional features are paired with a sleek design. The flattened spherical morphology is perfect for the mechanism lodge, and the designer takes advantage of this shape by placing its elements along the disk circumference. 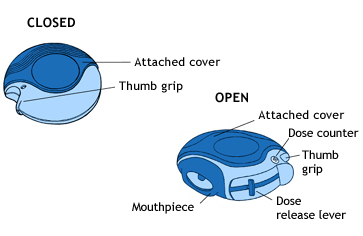 The container case shows a series of subtractions, such as the thumb grip and the release lever, while the mouthpiece is an extra piece but also follows the circle shaped pattern. The Diskus® has two positions. The first one, which protects the mouthpiece and the lever, shows the cover case and the thumb grip. Upon sliding the cover, we gain access to the dose release lever and the mouthpiece, while making the dose counter visible at all times. The use of color happens to be in a monochromatic scale, with the operating areas (mouthpiece, lever and cover) colored a darker tone. Once the device is unveiled, the way of using it is pretty simple. This simplicity is what makes it so user-friendly, especially among children who sometimes have to use spacer devices with traditional style inhalers. While some users think the spacers make the inhalation of the drug easier, others claim that said spacers are tricky to use and very slow. The Diskus® device does not require a spacer, making the whole sequence much easier to perform. The smart combination of graceful design and well thought out functionality for the user, as seen in this case, is what makes a designer’s job worthwhile. In the end, I believe design is all (or mostly) about helping people lead a better life -something that the Diskus® certainly accomplishes.